The wayward son of Americana comes of age. Coming hot on the heels of Justin’s previous album SINGLE MOTHERS, this is bound to draw comparisons; especially as it was originally meant to be the other half of a double album. Personally I think the decision to split them into two separate releases is the correct one; as each appears to be a separate entity in their own rite; and need to be listened to on different occasions; which is difficult to do with a Doubler. 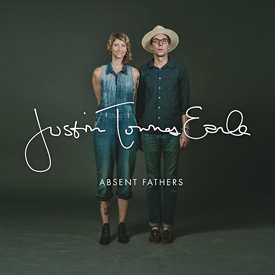 ABSENT FATHERS opens with a slightly bitter and gut-wrenching Country song, Farther From Me which throws down the marker flag for the whole album. Townes Earle’s songwriting just gets better and better; the older (and cleaner) he gets. Songs like Call Ya Momma and Slow Monday are as good as he’s ever recorded and only time will tell whom they will be compared with; but another man called Earle springs to mind. While Justin has always skirted around Alt. Country ABSENT FATHERS uses a steel guitar and brushed drumming to such great effect that this just might be his ‘Country’ album; and I defy anyone listening to the sublime When The One You Love Loses Faith not to agree with me. By the time you get to the final track Looking For a Place To Land the casual listener will be mentally exhausted as the subject matter is quite deep and occasionally dark; with Townes Earle finally growing into his voice and singing style; sounding like no one else at all. That final song is absolutely beautiful and just may be the writer tipping his hat in the direction of the man whose name he was given and which he wears with pride. How does ABSENT FATHERS compare to SINGLE MOTHERS? It’s the evil twin!